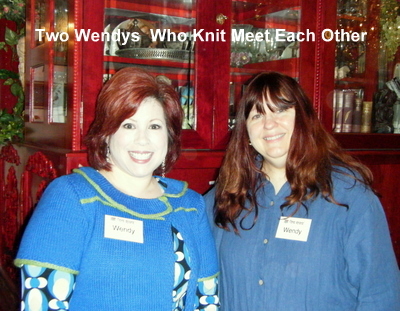 …where I met, among others, Wendy of Wendy Knits fame. We had a lot in common–both of us have Siamese-type cats, both of us are lefties and both have red hair. She knits better than I do, though. I also met and took classes from Jared Flood, Kate Gagnon and Courtney Kelley, and Tanis Gray. Tanis just moved to the DC area, so I hope to see more of her. This event was put on by fibre space (my favorite yarn store!) at the O Street Mansion in Dupont Circle. What an amazing place! I’ll try to post some more pictures of the house after I recover. Sounds like a pretty great time! Staying in a mansion? Fabulous!